Australia's most unique personality brings her outrageous observations home with the dvd release of The Dame Edna Experience: The complete series one. 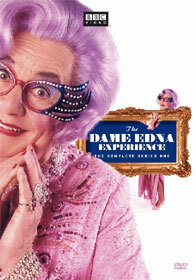 Featuring Celebrities Including Sean Connery, Charlton Heston & Jane Seymour, BBC VIDEO Brings Dame Edna To DVD. Hello Possums! Featuring the most colorful and uninhibited megastar housewife ever to grace stage or screen, The Dame Edna Experience: The Complete Series One premiered on British television in 1987 as a series of six shows which Dame Edna calls "monologues interrupted by total strangers." Hailed as "hilarious" by the Boston Globe, this first of three upcoming Dame Edna DVD sets features celebrity guests including Sean Connery, Charlton Heston, Zsa Zsa Gabor, Jane Seymour, Larry Hagman and Joan Rivers, who serve as foils (and occasional victims) for Dame Edna's rapier wit. In addition, the DVD boasts a bevy of added bonuses guaranteed to thrill Edna's legion of fans. There's a newly recorded, exclusive featurette in which Dame Edna reflects on the making of The Dame Edna Experience and its profound influence upon all talk shows to follow. The two-disc set also features the BAFTA-winning program, An Audience with Dame Edna Everage, where Dame Edna fields questions from a celebrity audience. Rounding out the bonus section are a 1976 performance by Dame Edna of her signature number, "Niceness," and two interviews with Dame Edna creator Barry Humphries, one of them conducted by Dame Edna herself! Wherever the eyes of the world are focused, wherever history is in the making - SHE is there. In the corridors of power, behind closed doors, she is the one the leaders follow. Jetting around the world to bring words of comfort to the bewildered, ever ready to share herself with her public. Interrupting her busy schedule to be with us tonight - ladies and gentlemen, Dame Edna Everage! Dame Edna on The Dame Edna Experience - a newly recorded, exclusive feature in which Dame Edna looks back on the making of The Dame Edna Experience and its influence on all talk shows to follow. An Audience with Dame Edna Everage - Winner of the British Academy Award (BAFTA) for Best Entertainment Program in 1981, An Audience with Dame Edna Everage finds Dame Edna strutting her considerable stuff for an audience made up entirely of celebrities, including Ab Fab star Joanna Lumley. Edna provides outrageous answers to their most personal and probing questions. Two interviews from 1992 with Dame Edna creator Barry Humphries, one of which is conducted by Dame Edna herself!